ZARA, Cherry Creek — Denv.Her. It happened friends! ZARA is now officially open in Denver in Cherry Creek’s Shopping Center (the 100th store in the U.S.) & to say that we’re excited about it, is an understatement. denv.her. was invited to the grand opening and not only did we leave with some amazing fashion pieces, we also gained new information about an eco-friendly ZARA that we weren’t aware of before! First thing we noticed when we walked into ZARA? The place was spotless you guys - it was absolutely pristine and the color coordination and styling of the clothes throughout the store was impeccable. My sister and I were drawn to pieces in EVERY. SINGLE. SECTION. and I can honestly say this is the first store where this has ever happened. Generally you’ll walk into a store and find a few things you like - oh no, no - we wanted it all. & we can concretely say this will now be one of our favorite stores to shop at moving forward. The way ZARA outfits the pieces on the racks makes grab-and-go outfitting easy! They even place shoes and accessories on and below the clothing racks making building a comprehensive look effortless. Zara’s clothes are v buyer friendly and prices range from $20 for graphic tees to $150 for winter jackets. We were given a short presentation on ZARA - the store prides themselves on staying true to Inditex Group’s environmental commitments. 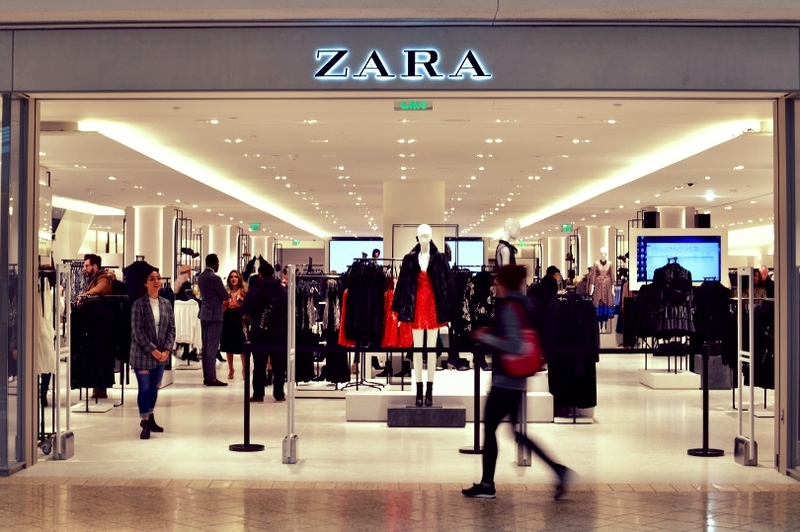 The LED lights seen in the ZARA store boast for greater energy savings. In 2017, ZARA recirculated 110 million (MILLION) plastic hangers #savetheturtles #iliketurtles. ZARA also ensures their factories in Spain maintain a close proximity to their 1824 supplies to keep pollution and emissions down. ZARA prides themselves on listening to their customers and that is why you will see all the latest trends from across the globe in the store. I noticed this right off the bat from following bloggers on IG over in Europe - ZARA pulls their data based on global fashion trends so whatever is “hot” and selling over in the ZARA’s in Europe, they incorporate right into the US stores (and vice versa). ZARA focusing on global fashion is one of the things they attribute their major success to - we hands down can concur this fact from our visit. What did denv.her. end up with?! This sparkly cable knit sweater spoke to us - with it’s cropped body and gold metallic effect - we weren’t leaving the store without it. This snakeskin skirt and gold drop earrings were situated right next to this sweater making it V easy to pull this look together. ALSO these earrings are clip-ons which we LOVE. The heavier earrings tend to hurt our ears so whenever we have a chance to get our hands on fashionable clip-ons - they will be bought lol. Next up? This snakeskin blazer caught our eye! We paired this blazer with a lace camisole and a snakeskin skort - for the life of me I couldn’t find the matching skort that goes with the blazer on ZARA’s site but linked a similar one. If you go into the ZARA at Cherry Creek, you’ll be able to find the matching skort right with the blazer! This graphic tee and red leopard print skirt? #musthave . We also loved how this graphic tee seemingly has the same clip on earrings we picked out, on herself! As you can tell - we can mix and match a lot of the pieces we purchased from ZARA. We walked by this Elton John Graphic tee and noticed how it’s gold border would match well with the faux suede snakeskin skirt we had picked out earlier. HUGE thanks to ZARA for inviting us to your 100th’s store’s opening! We will be back v soon and hope to see all you Denverites there! Happy shopping!